The war was over, but much hadn't changed. People with abilities like Shylah McKay may have helped win the war, but they weren't trusted. Members of the Gemini Order were outcasts in a world they had helped save. It had been a decade since Shylah had met Grayson near the end of the war. They were together constantly. He was almost everything she could wish for in a man. There was one slight problem with their relationship. Grayson was a ghost. Shylah and Grayson and the rest of the Gemini Order were just about to learn how much things hadn't changed. Perhaps the battle had been won, but war still threatened. But what was the truth? Who were friends, and who truly was their enemy? Such lines can often become blurred. The only truth that Shylah and Grayson know is their love for one another. 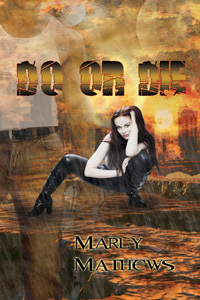 Do Or Die is a phenomenal science fiction read by Marly Mathews. I simply loved this story. It was a little different having the hero and heroine already together at the beginning of the story, but it didn't diminish the romance in the least. Also, they had obstacles to overcome, both he as a ghost, and the looming battle ahead. I loved the interaction with all of the secondary characters, and would be thrilled to return to this world again.